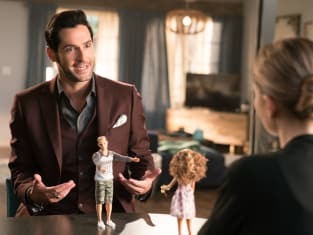 Lucifer Season 3 Episode 8: "Chloe Does Lucifer"
Luci, I'm likin' this new you. Boring suits you, brother! Permalink: Luci, I'm likin' this new you. Boring suits you, brother! Amenadiel: Honestly, Luci, who cares how you spend your nights? Lucifer: Um, EVERYONE! My exciting lifestyle gives regular people something to aspire to! I provide hope!